Voted #18 Cigar Aficionado Top 25 Cigars Of 2016! Handmade at the acclaimed Races Cubana factory in Danli, Honduras, Alec Bradley's Coyol contains a rare blend centered around tobaccos from the Honduran farm of the same name. Medium to full in body, Coyol farm tobaccos are present in all three components of this bold new offering: wrapper, binder, and filler. Balanced notes of earth, leather, and pepper lead the way for nuances of nutmeg and cherry sweetness in this complex and aromatic creation. "Sometimes tobacco has great aroma or great flavor, but rarely does one have both," said company president Alan Rubin. "That is what makes Coyol so unique." 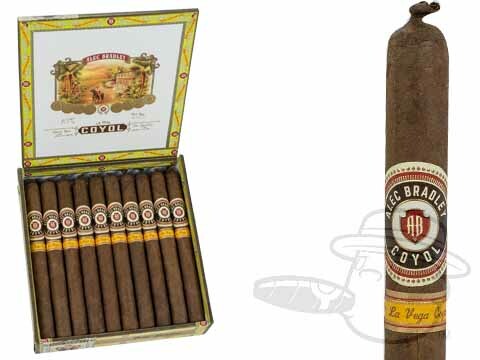 Coyol Petit Lancero By Alec Bradley is rated 4.6 out of 5 based on 1 customer ratings.